What exactly are tertials? Tertials are the innermost secondary feathers closest to the body. 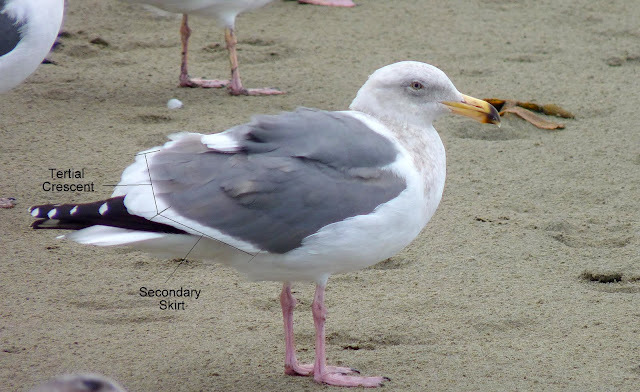 Each wing typically has three, and on gulls, these feathers are elongated and quite noticable (on the standing bird). Adult and near adult gulls of most species have tertials that are tipped with white, forming a tertial crescent. 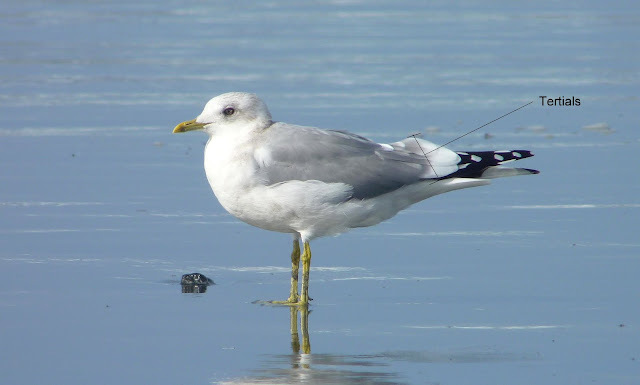 Some species have small and unappreciable tertial crescents, whereas others, such as this adult Mew Gull (L.c. brachyrhynchus), have large and bold tertial crescents that contrast nicely with the gray upperparts. The tertials on this individual appear to be fairly new and fresh. Notice how they're elongated, covering the bases of the primaries. Morro Bay, CA; 18 Jan 2010. 3rd cycle type Western Gull. Morro Bay, CA; 18 Jan 2010. Techinally, the tertials qualify as flight feathers, but functionally, they protect other flight feathers such as the bases of the primaries and parts of the secondaries when the wing is closed; thus, they act as coverts just as much as they do flight feathers. I was expecting to see these black-centered feathers at the proximal part of the wing, just where the secondaries meet the body. I was obviously missing something and needless to say, this bird started driving me nuts! I watched it land again and again making sure it was indeed the same individual that I followed in flight - there was no doubt that it was. It was obvious that the tertials were tucked away somewhere, but where? I went home and consulted several sources and finally found my answer in Grant's identification guide: "Note that the scapulars extend back as the wing is opened, covering the tertials completely in flight" (p.25). The scapulars, along with the interscapular area known as the mantle, are what we typically call a gull's back. The scapulars cover the gap between the bird's wings and body. The 3-4 longest scapulars, also known as subscapulars, extend far enough when fully grown so that they line up with the trailing edge, and occassionally beyond. Species with small scapular crescents show a noticeable break in white along the trailing edge as the inner secondaries approach the body. I think I may have overlooked Grant's note because the scapulars - on the standing bird - don't seem long enough to cover the tertials. However, once the wing is spread, the tertials are pulled in and the scapulars are extended back, forming two layers of feathers with the scapulars on top and the tertials underneath. My mystery was solved!